Andy Aitchison lectures in Criminology and co-directs the MSc in Global Crime, Justice and Security at the University of Edinburgh. He has previously worked in research roles with Cardiff University and the UK Home Office. His research can be divided into two broad strands, both connected by a long-standing interest in Bosnia and Herzegovina. 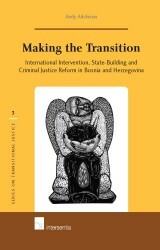 The first of these relates to questions around the reform and reconstruction of criminal justice institutions in post-socialist, post-authoritarian and post-conflict contexts. Themes of international intervention and democratisation run throughout this work. The second strand of work deals with the criminology of atrocity, a field that has seen significant development over the past 15 years. He supervises at doctoral level across a range of topics related to post-socialist politics and policy, including criminal justice policy, police governance, transnational and international crime, and transitional justice.